Do you like Rapunzel Sweet Summer Party? Share it with your friends. 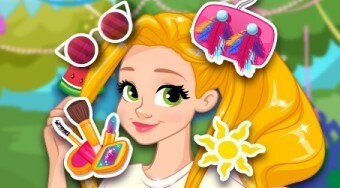 Rapunzel Sweet Summer Party is a great girl game where Princess Rapunzel and her friends are invited to the biggest summer party this year. Help the other three princesses choose Rapunzel make-up, hairstyle, clothes, and fashion accessories to make her party the most enjoyable.